I have two exciting events coming up! 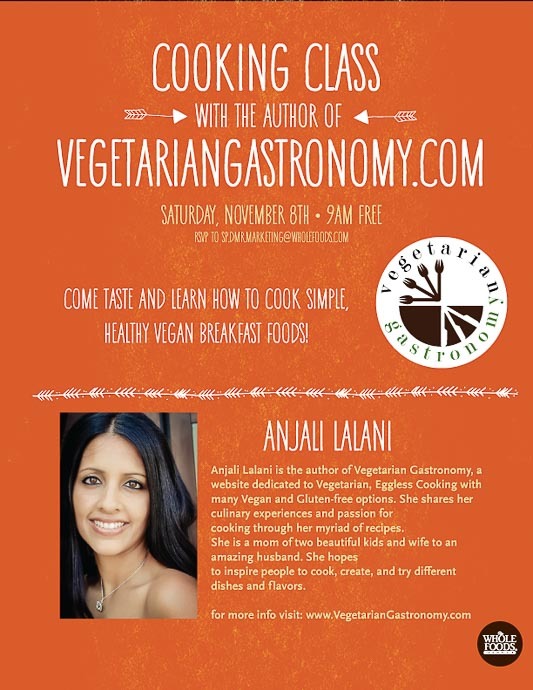 I will be teaching my next Cooking Class at the Whole Foods Market in Del Mar on Nov 8th 2014, and I was asked to be a guest at the World Compassion & Vegan Day Event this coming Saturday, Nov 1st 2014. Back in August, I posted about my new partnership with the Whole Foods in Del Mar, CA. I ran my first cooking class there in August, and it was a huge success! The theme for my first class was Vegan, Gluten-Free Mexican Food. I did a demo on how to make my Four Bean Quinoa Veggie Tacos, Chunky Tomato Salsa, and Dark Chocolate Mousse. The class was completely full, everyone loved all the dishes (there were NO leftovers), and I was instantly invited back by Whole Foods to host Cooking Classes there every other month. It was awesome to meet people there eager to learn how to cook some of my recipes. It was my very first cooking class and I had an amazing time doing what I love to do, watching people enjoy my recipes, and interacting with my guests. My next cooking class will be held Saturday, November 8th 2014, from 9:00-10:00 AM at the Trifecta Tavern inside the Whole Foods in Del Mar, CA. These classes are FREE and open to the public, so if you live in the San Diego area, I would love for you to attend and have the opportunity to meet you in person. For this next class, I will be running a demo featuring some of my favorite Simple, Healthy, Vegan Breakfast Foods. You will also receive a recipe card for each featured recipe. To sign up for this FREE class, RSVP to sp.dmr.marketing@wholefoods.com or vegetariangastronomy@gmail.com, or simply comment below by Friday, November 7th, 2014. Space is limited and my last class was completely full, so sign up today! The image above is the promo flyer made by Whole Foods in Del Mar for this upcoming class. 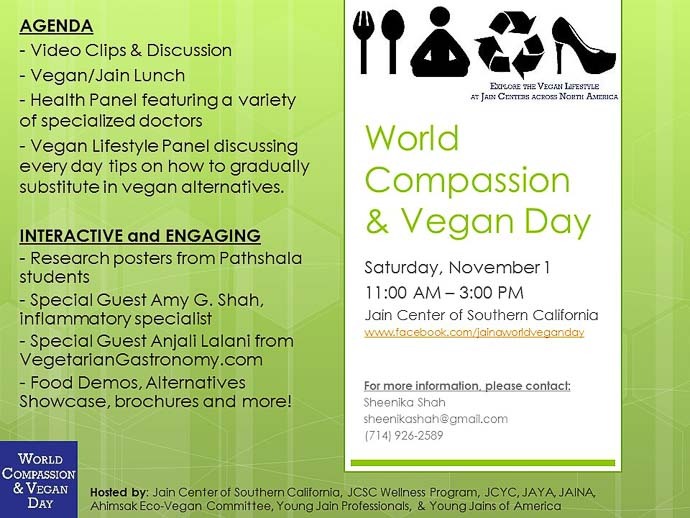 About two months ago, I was contacted by the a member of Young Jains of America (YJA) and asked if I would attend and be a special guest at their upcoming World Compassion & Vegan Day Event. World Compassion and Vegan Day was started to share stories and inspire others to learn about a plant-based vegan lifestyle. The program will be informative and engaging with various documentary clips, discussions, a vegan lunch & desserts, education on how to cook with vegan substitutes, nutrition specialists, as well as many booths with information about diet, health, fashion, environment, and various other educational brochures. I was very excited and honored to receive this invitation to put up a Vegetarian Gastronomy booth. Not only will I be running a small food demo, but I will have a few food samples at my booth in addition to recipe cards for you to pick up containing some of my favorite vegan recipes. The event is being held at Jain Center of Southern California on Nov 1st 2014, from 11 AM – 3 PM. This event is open to everyone. Hope to see you there! Although I personally do not follow a JAIN diet, for those of you curious or interested, you can fine more JAIN dietary information on the YJA website under FAQ.